Whether she’s on the hard or in the water, before winter really sets in there are a number of essential checks that should be carried out to ensure your boat is protected. Maybe you’d hoped to use her more than you have, or she’s packed away and put to the back of your mind. Either way, we have a few suggestions to keep your pride and joy safe and sweet for 2016. At one time, laying up your boat was a big deal and boatyards hummed as owners set about preparing their boats for the winter. Now, thanks largely to modern, more durable materials, boats stay afloat longer and when they do eventually come ashore, there’s a temptation to simply leave them in a state of suspended animation until the start of the following season. In reality there’s much to be done as the winter frosts set in and daylight hours drop into single figures. By taking a few fairly simple precautions you can often avoid more serious problems when you come to open her up in the spring. With the cost involved in sailing, it’s understandable that many people try to stretch the seasons a little and get at least a few months of autumn cruising done before putting their boats away for the winter. But if you haven’t yet fully de-commissioned her, now is the time to think how much you will actually be using her, and to prepare her more thoroughly for the harshest winter months. No one likes homework but wherever your boat is based, there are a few small jobs that can be done between visits to spread the work over winter – rather than trying to rush through them all in spring. Put all of your running rigging in the washing machine after ensuring no shackles are still connected. Alternatively, commandeer the bathtub, wash in fresh water, dry and hang up somewhere warm and ventilated. Now you’ve got all the lines back at home and cleaned, why not spend some time cutting off the worn ends or chafed sections and whipping the ends neatly? If you’ve removed your sails and taken them home for safekeeping, now is the time to check them over. Send your partner out on an errand, then spread the sails out in the sitting room to check the stitching and find any spot where they’ve chafed. Soak out any stains on the sails, if you can, or take them to your sailmaker if you can’t. Ultraviolet light can cause serious damage to a yacht over time. Now’s the time to make covers for deck items that are vulnerable to UV degradation, fading and cracking. If you have wooden washboards, it’s a good idea to make up some temporary winter boards to leave in place while you bring the real ones home for varnishing under cover. The same goes for other wooden detachables – I have my tiller, outboard bracket and washboards all here in my shed being prepped ready for next spring. Bring your chartplotter home, treat it to a warm bed for the winter and prepare to download all the latest chart updates before next season. Paper charts also need to come home for safekeeping and updating. Most boat owners still prefer to store their boat ashore during the winter. It allows her to dry out and you can reach all over for maintenance. Here are a few extra precautions you might want to take before finally leaving her to fend for herself during winter out on the hard. 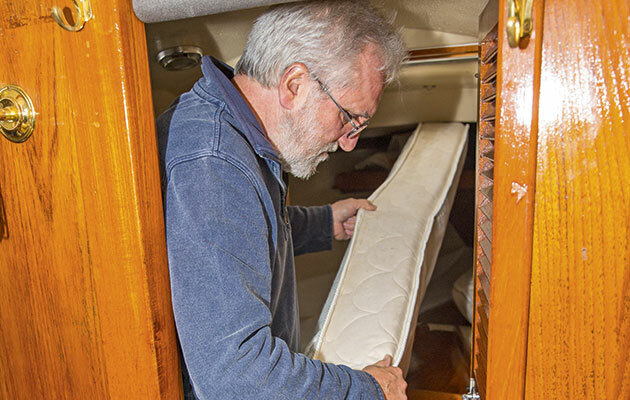 If you haven’t yet done it, remove as many items as you can from the boat to prevent mould and mildew forming, including sails, cushions, curtains, clothes and bedding. If it’s not practical to remove the settee/bunk cushions, prop them upright on an edge to let the air circulate around them. As any sailmaker will tell you, the best way to treat your sails over the winter lay-up is to have them laundered as soon as you take them off and then stored in a warm, dry place. 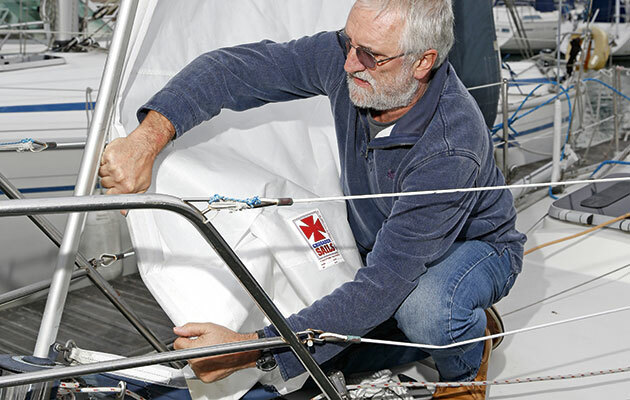 Leaving them at the sailmakers is the preferred choice of many, but if you’re on a tight budget, pick a dry day before it gets too cold or windy, hoist the sails and hose them off thoroughly with fresh water. Leave them to dry before taking them off and putting them somewhere that is warmish, but more importantly dry with good ventilation. 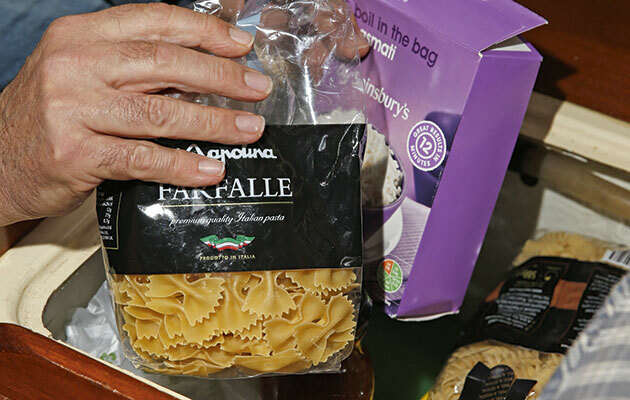 Assuming you’ve already done the obvious, such as emptying the fridge and leaving its lid or door wedged open, check you’ve also removed any food or drink that’s likely to go beyond its consume-by date over the winter months. It’s surprising what you find deep in the bilges or at the bottom of lockers. Boats left on the hard get much colder than those left afloat as the wind will whistle around the hull, greatly increasing the chill factor. For this reason it’s essential you remove all freezeable liquids from the boat to prevent damage, even if you intend to leave a small heater on board. Now is the time to empty your water tanks, including the calorifier (hot water tank) if you have one, and run the pipes, pumps and filters empty. In any decent installation the tanks will have drain taps at their lowest point, but often it’s easier if you have a pumped system and shore power to simply turn the taps on to empty everything or pull the pipes off the tanks and drain into a bucket. 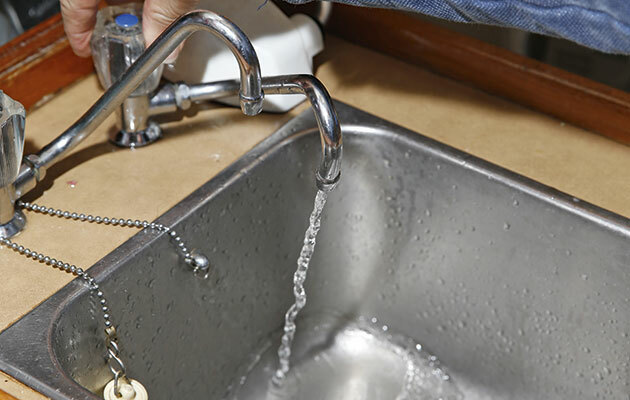 Leaving the taps open once it’s all empty will allow small amounts of water remaining in the pipes to expand without damage, should it drop well below freezing. 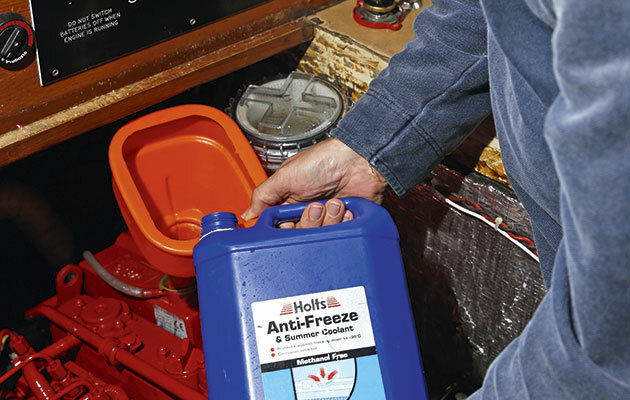 Some boat owners advocate draining the engine block too, but engineers I have spoken with insist it’s much better to ensure it is filled with the correct amount of anti-freeze fluid, as it also contains anti-corrosion products to stop any rust building up. An empty engine block and heat exchanger will be very prone to rust over the winter, which can create blockages, reduce cooling circulation and could possibly overheat your engine when you start it up again. I’ve seen quite a few boats that were flooded during the winter storms, much to their forlorn-looking owner’s surprise. 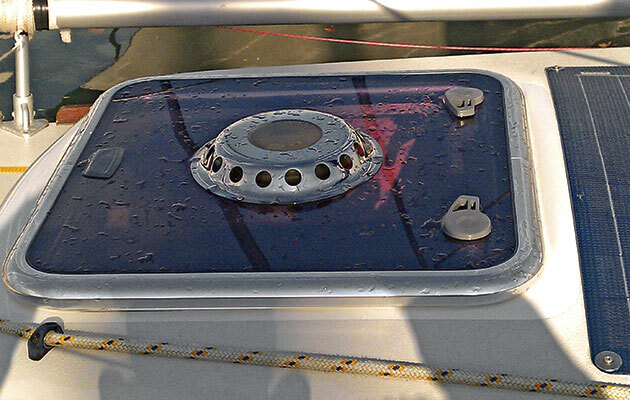 Even if you leave the cockpit hood on, or cover the boat with tarpaulins, she can suffer if the drains aren’t kept clear of leaves, acorns, sycamore seeds and so on. If your cockpit isn’t covered, the simplest solution is to put some form of strainer over the drains. I’ve seen tea- and even vegetable-strainers used very successfully for this, simply by placing them upside-down over the drains. And when was the last time you checked the cockpit drain piping and hose clips? 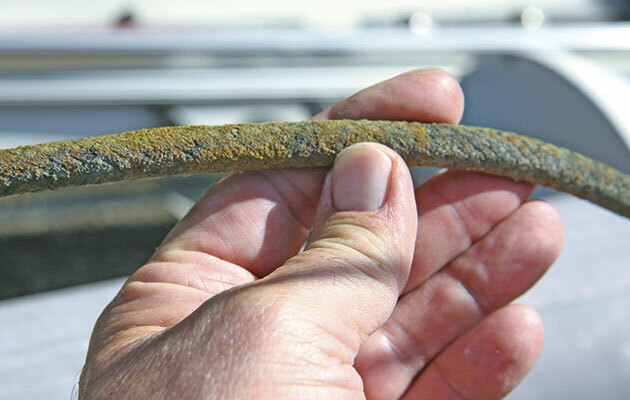 They often rust away quickly and very few boat owners ever think of changing these hoses, for some reason, so they often harden, crack and subsequently leak. 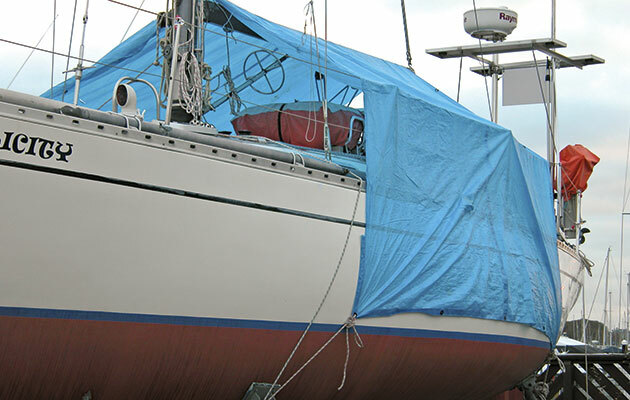 A word of warning – if you do resort to tarpaulins, make sure they’re not resting against the hull or topsides and ensure they’re not blocking any vents. Spreading a tarp over a cockpit without putting bars or a frame across it first will create a big, heavy swimming pool for the birds and stretch the material, making it leak. Most cheap plastic tarpaulins also disintegrate very quickly in the wind and under constant UV light, breaking up into long strands of fibre, which in turn block deck and cockpit drains. If you’re leaving the boat unsupervised for several months or more, I suggest you buy a good quality canvas tarpaulin or a proper boat cover. The best way to keep your boat dry and free from mildew and mould is to thoroughly clean all interior surfaces, removing any damp or salty deposits, and then ensure good ventilation, leaving all lockers open and the cabin sole boards up. During my 40 years of boat ownership I’ve learned that, when you’re not on the boat, adequate ventilation is all you need to keep her smelling sweet. It costs nothing, is easy to do and carries no potential hazards. Of course, if your boat lets in rainwater through dodgy deck fittings, then you’re likely to get damp problems regardless, but much of the rest can be solved by ensuring the air inside your boat is changed constantly. Older boats traditionally have cowl vents with dorades, designed to allow air in but keep rain and seawater out. The trick with cowl vents is to point their openings in different directions, so that one becomes an ‘in’ vent, the other an ‘out’ vent. Venting the washboards with a simple, close-able grill is always a good move, and it’s also well worth fitting one one between the anchor chain locker and the forward cabin, which then acts as a giant dorade provided it drains at the bottom. If your boat doesn’t have any cowl vents and it’s not practical to install them, then you can often fit mushroom-style vents instead. These are cheap, effective from all wind angles and relatively waterproof – certainly from rain. Solar-powered models are even better, as they force air in and out to create circulation but cost nothing to run. Seacocks can rupture if ice forms and expands inside them, so leave them half-open. Alternatively, leave them all the way open and remove inlet/outlet hoses to aid ventilation. It’s also an opportunity to check the hoses and clips. Warning: be sure to leave a note somewhere to remind you to replace them before launching! Take transducers out for additional ventilation. Note the warning above. Stuff a rag up the exhaust to keep insects out. Again, note the warning above. Don’t leave fenders hanging. 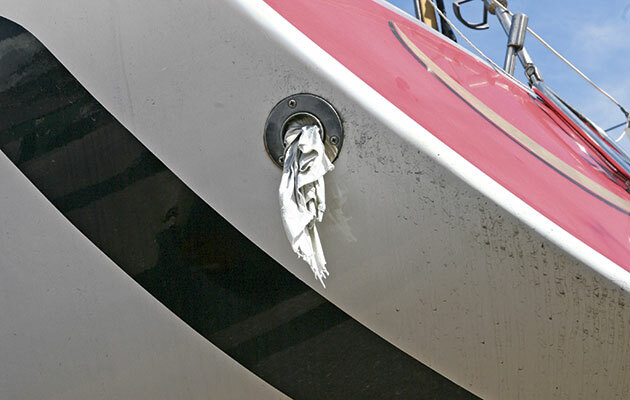 Remove to stop them scratching the topsides in the wind. Take your anchor and chain out of the locker to prevent it from rusting up. Although if it’s already getting rusty, you might question this. Reduce windage on your boat by taking off sails, sail covers, sprayhoods, spray dodgers and so on. Although leaving your boat in the water can often be less expensive than on the hard and it also opens up the possibility of some winter sailing, there comes a point when most owners know they’re unlikely to use her for a few months at least, at which point you need to take steps to ensure she’ll be safe and secure in the darkest days of winter. Boats are often more secure in the water during the winter’s high winds. There’s no danger of her falling off props or cradles and it’s also much warmer in the water, so engines and water systems rarely freeze up unless the weather is exceptionally Arctic-like. It also makes a lot of sense to take your boat out of the water in the spring, when the days are lengthening and the weather is better for working on her. If you’ve decided to leave her in, do check your insurance policy, as some companies put a clause in your contract insisting she is lifted ashore during the winter months and this is no time to be without insurance. Now that you’ve finished for the season, you need to consider whether or not to leave the shore power connected to the boat. Leaving your boat afloat and permanently connected isn’t ideal. Not only does it cost, but it can also create problems with galvanic corrosion to your underwater metallic gear unless you have a galvanic isolator fitted to the shore power earth circuit or your shore power is fed in via an isolation transformer. Should you disconnect your batteries? 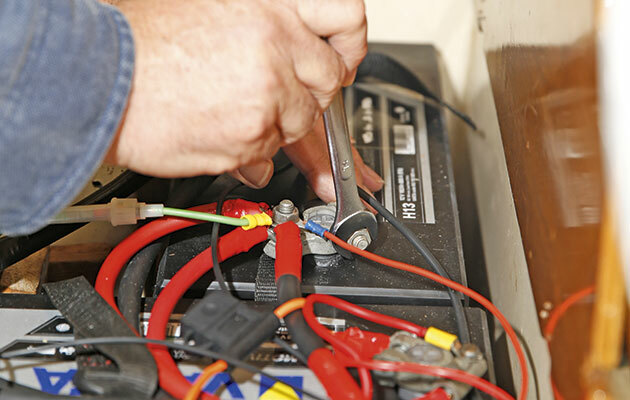 While it is tempting to leave a mains battery charger on the whole time, it makes more sense to disconnect the batteries completely once they’re fully charged. That way nothing can inadvertently drain them and there’s no chance of any electrical faults causing a fire risk. 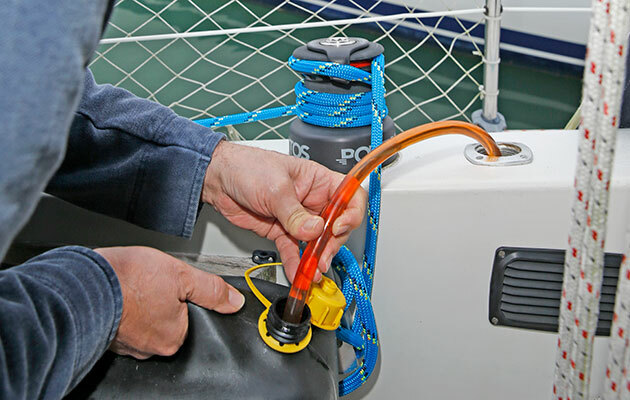 Of course if you have an automatic bilge pump or alarm system you may prefer to keep these items connected via a fused circuit, but all other items can be depowered. Most modern batteries, particularly AGM, gel or similar dry electrolyte-type cells, will hold their charge for up to six months without attention. But if you’re worried, or you have standard flooded-cell lead-acid batteries that self-discharge quite quickly, why not fit a small solar panel just to keep them topped up when you’re not on board? For around £60, a simple 10W photovoltaic solar panel will produce enough amps during the day, even in the winter, to keep a 100Ah lead-acid battery topped up. If you have the corrosion protection and feel leaving the power on isn’t a problem, then you’ll probably also be considering leaving either a heater or a dehumidifier on permanently. However, it’s worth noting that the time you really benefit from having an electric dehumidifier is when you’re on board, as your breath is the biggest creator of condensation, followed closely by the use of gas appliances. By all means put a small (200W) bar heater or oil-filled radiator on board, just to keep it from getting too cold and to create a small movement of air, but don’t be tempted use a fan heater, even one with a thermostat, they present a serious fire risk if they fall over and they’re horrendously expensive to run. Close all fresh-air vents for maximum efficiency or you’ll be trying to dehumidify the entire atmosphere. The ideal boat dehumidifier should have a permanent drainage option, so that you don’t need to keep visiting the boat to empty the internal water reservoir. The drainage pipe can simply be put into a sink or permanently plumbed into the sink drain. Some dehumidifiers don’t automatically switch back on if the mains power is disconnected, which could prove pointless if, like many, your shore power frequently trips out. Keep the filters clean – this is the single biggest cause of dehumidifiers overheating and causing fires – and check on them every few weeks at least. Buy a dehumidifier with a built-in humidistat, which will switch off to save power when a pre-set humidity level is reached. If you’re leaving her on a mooring then all the above applies, but extra precautions are obviously necessary to ensure your mooring line isn’t going to chafe. 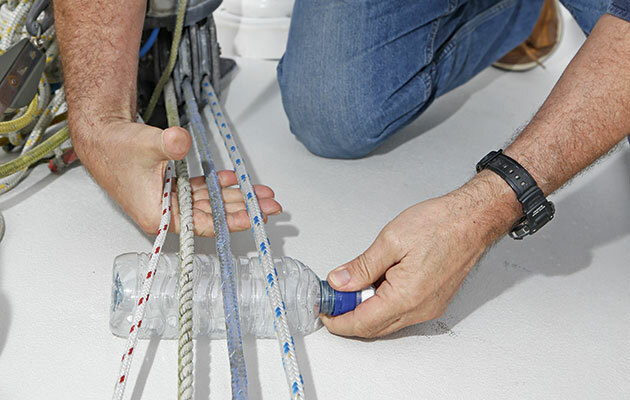 The mooring line should preferably be chain, but if you do use rope it needs to be anchorplait or at least three-stranded nylon, and make sure you run it through reinforced hose pipe over wear points and add a second, fall-back line. Reduce windage on your boat by taking off sails, sail covers, sprayhoods, spray dodgers and so on. It’s very common to see a boat on a mooring with her furling genoa unrolled and shredding itself to death or a sprayhood with its wings flapping manically in the wind, just before it self-destructs! 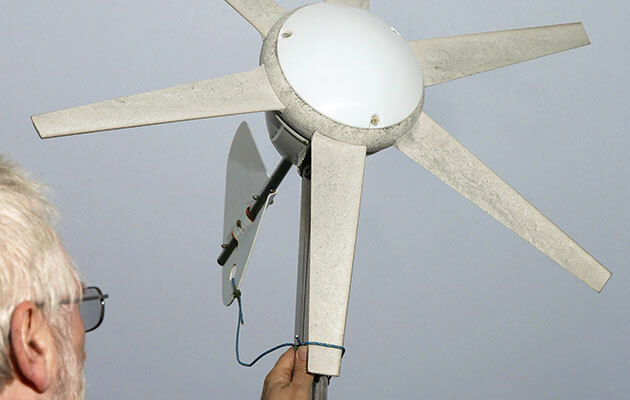 If you need power on board (to run an automatic bilge pump, say), then consider fitting a small wind generator (the low-power vertical models are good for this) or a small solar panel to keep one battery topped up. Check for leaks and remove anything vulnerable to water damage. 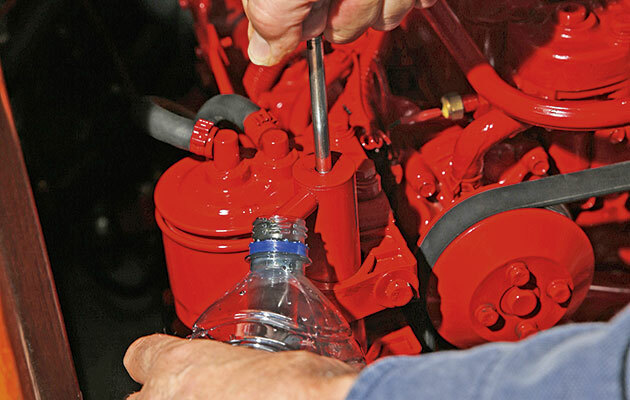 Try to cure leaks now, don’t leave it till spring. Visit the boat at least once a month, or get someone else to. On each visit, sponge out any accumulated water. Check first whether it’s fresh or sea water. 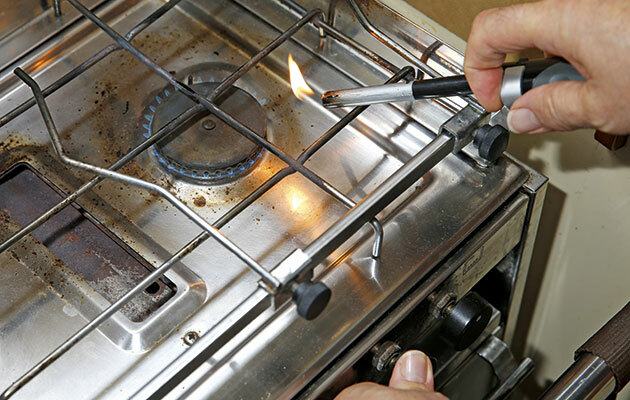 Having burnt off any gas in the pipes before you left her, check you have also disconnected the gas bottle. Put a meter on the batteries and make sure they’re holding their charge. You might even decide to take them home to recharge them between visits. Check that your vents are open and not covered by a tarpaulin. 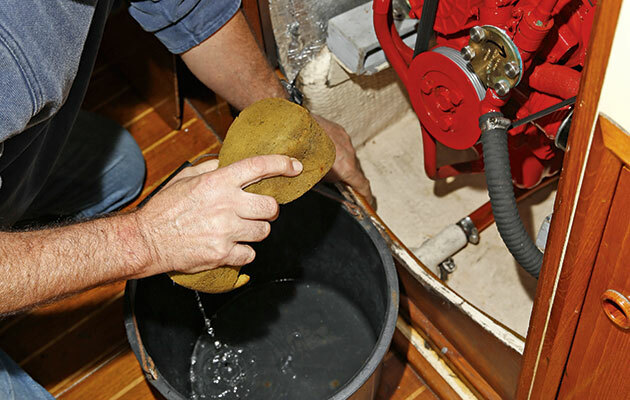 Give all your blocks, rope clutches, travellers and furler swivels another flush-out with fresh water, to rinse away any accumulated salt. Ensure any lines or poles you’ve left on board are still lifted clear of the deck to avoid them collecting dirt or going green. Inflate any flaccid-looking fenders. If you haven’t already done so, change the engine oil and filter to prevent any acidic traces in the old, contaminated oil from damaging engine parts during the winter. Also check and/or replace the impeller and its O-ring. Make sure you have topped off your fuel tanks to avoid condensation forming and as a precaution, dose the fuel with a diesel bug treatment. 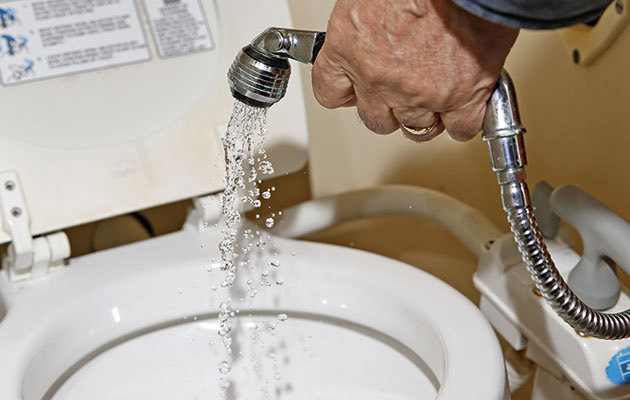 If you’ve used the loo during your visit to the boat afloat, remember to pump the toilet dry again and then flush it through with plenty of fresh water. Pump out, flush and deodorise the holding tank if you have one, then leave it empty and dry. It’s important not to let your insurance cover lapse over the winter period as there’s a whole host of possibilities that could go wrong, both ashore and afloat, including theft, fire, vandalism, damage by vehicles, storm damage, frost damage and even the chance of being blown over in a particularly vicious winter gale. Also, if there’s a stipulation on your insurance policy that your vessel is ashore by a certain date, then that condition must be complied with, or you risk invalidating your entire policy. If a lift-out date is put back due to weather, tides or crane problems it’s important to advise your insurers and get an extension. You should still check on her periodically throughout the winter or pay someone you trust to do it for you. Just before you go, give all interior surfaces a quick whizz over with anti-bacterial wipes to avoid mould or mildew growth and remember to leave as many lockers and stowage bins open to the air as possible, even sole boards where you can. It’s no good sorting out the ventilation if the air can’t circulate. Finally, remove any kit to service at home – don’t avoid your homework.